John Penton and his motorcycles are still extremely popular today, evidenced by the fact that several hundred members of the Penton Owners Group traveled from all over the US to celebrate the 50-year anniversary, together with John Penton and his sons Jeff, Jack, and Tom, who are all former Enduro riders and former Six Days participants. Among roughly 100 classic Penton vehicles from all model years and preservation states, “Steel Tankers” could also be seen with factory numbers V001, V002, and V003 – it all began with these exact motorcycles half a century ago. 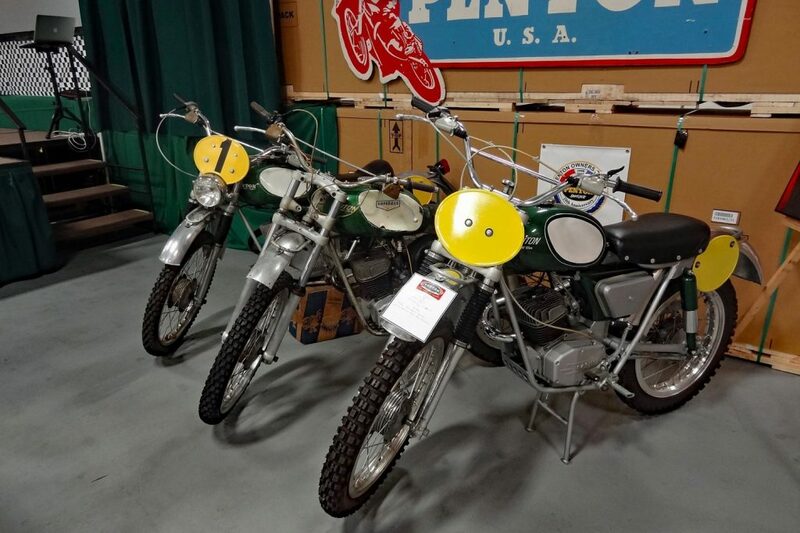 On March 7, 1968, Wally Wilford collected a very special shipment from the airport in Cleveland, Ohio: the first ten Penton motorcycles were flown to the US from Austria. Just one day later, six of these machines were loaded for transportation to Georgia, where they would make their debut in the Stone Mountain Enduro on March 10, 1968. At the time, unpacking prototype motorcycles from the transportation crate and sending them for acceptance testing for a championship race was certainly a big risk. Under these circumstances, the result was more than impressive, with two class victories, one second and one third place in this challenging event. We were “READY TO RACE” as early as the late 1960s. Back then, the Penton motto was “Built for Champions”, and the best publicity was the success of the Penton riders. After Stone Mountain, the riders took on the Alligator Enduro in Florida and the bikes made their first appearance at the motorcycle exhibition in Daytona. This attracted a great deal of attention, as a Penton was stood on a large boulder and presented to an astonished audience. Even the type designation of the Penton was unusual, as Penton motorcycles were given proper names, and this was unconventional at the time. The 100cc was called “Berkshire”, named after a popular Enduro event in the New England States, and the 125cc was called “Six Day”. Doug Wilford, a longtime companion of John Penton, later explained how this came about. After competing in his first Six Days Enduro in Garmisch-Partenkirchen in 1962, John Penton knew the demands that would be placed on an Enduro in the International Six Days Trial, formerly known as the “Olympics of Motorcycling”. The best of the best was just good enough, and so the 125cc was given the name “Six Day”. What John Penton and KTM had achieved was impressive. In September 1967, after competing in the Six Days Enduro in the Polish city of Zakopane, Penton approached KTM with his proposal for a lightweight and affordable competition bike for the American market. Just six months later, the results were presented to the public in Daytona, along with the first accolades for an American championship race. However, there were problems in the beginning, particularly with customer’s bikes. The selector key transmission of the brand-new Sachs engine proved to be rather fragile, as the selector key often could not withstand the stresses it was subjected to on the terrain and would break. KTM in Austria and Fichtel & Sachs in Germany were too far away, so rapid assistance was not possible – was this the beginning of the end for the new brand? Not at all. A reinforced key was designed in the Penton workshop, and the prototype was sent to KTM to ensure that all Pentons delivered in the US were already fitted with the reinforced transmission. In the meantime, John Penton also got down to work and dismantled engines when disappointed customers came to him with a broken transmission. This is probably the biggest secret of the Penton bikes’ success: the Pentons and their former customers are still one big family today, as demonstrated in the 50-year anniversary celebration. However, it didn’t end with the Berkshire and the Six Day. As there was no 175cc engine in the Sachs range, John Penton designed a larger cylinder equipped with a Sachs crankshaft as standard, which had a displacement of 150cc. This was sufficient to start competing in the 175cc class. At KTM in Mattighofen, the developers were already working on a successor model for the Penton, which was launched on the market in 1971 alongside the stabilized Sachs engines and the first KTM engine with 175cc. Although John Penton was no longer involved in the development of new models, the Penton logo could still be found on KTM motorcycle tanks until 1977.